Bucharest is known for its wide, tree-lined boulevards and historical treasures. Here, you’ll see the Arc de Triomphe-built in honor of WWI soldiers-and the historical Royal Palace Square. You’ll take part on an exciting excursion to the serene Danube Delta a UNESCO World Heritage Site. Enjoy guided sightseeing in Constanta and Bulgaria’s ancient capital of Veliko Trnovo. Visit the Ethnographical Museum and Church of the Nativity in Arbanassi, and take pictures of Belogradchik’s eclectic group of rock formations and the spectacular scenery of the Iron Gates. Visit Belgrade, the capital of Serbia, and one of the oldest cities in Europe. 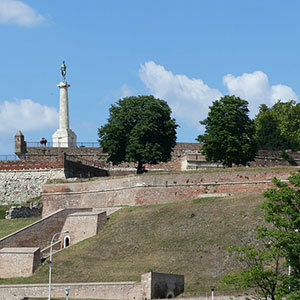 Continue your cultural journey on an excursion to Pécs, Hungary, also a UNESCO World Heritage Site. There are countless memorable moments on this fascinating river cruise through Eastern Europe, and it doesn’t end until you’ve experienced the unique energy of Budapest. Set along the banks of the Danube River, the capital of Hungary offers an eclectic mix of activities. A local expert introduces you to the must-see sights, such as Heroes’ Square. And with free time to explore on your own, perhaps walk across one or more of the city’s famous bridges, shop for Herend porcelain or handcrafted embroidery, and bask in the coffee house culture with a rich cream cake in the renowned Gerbeaud Café. From the Black Sea to Budapest, your European river cruise will take your breath away with the spectacular beauty and grace of the legendary Danube River and its stops along the way.